The results of the 2017 Peñín Guide were published recently, and our wines got an exceptional score this year, with 14 wines scoring from 90 to 93 points. Specifically, three of these wines got a score of 93 points, the highest of all of the wines ranked—one more wine than last time. There were two red wines, Belat and La Milana, and the sparkling wines Clàssic Penedès, Brut 21 Barrica, which were given this score by the wine tasters from the Peñín Guide. Next, with 92 points, are El Blanc XXV and two red wines, Reserva Martí and Ocell de Foc. They are followed by 100% Xarel·lo and El Fanio, with 91 points, and lastly, with 90 points, seven more items, including white, red, sweet, and sparkling wines: 3 Macabeus, Chardonnay Col·lecció, Lignum white Syrah Col·lecció, Dolç Adrià, Brut Nature Reserva 3, and Brut 21. 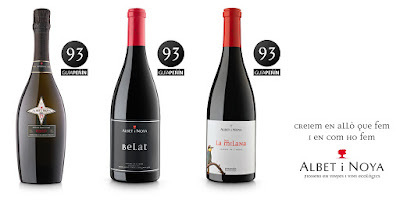 These scores make us the vineyard with the greatest number of wines ranked of all the wines from the Penedès denomination of origin, and the second-highest-ranking vineyard of all Catalonia, after Castillo de Perelada, which had 17 wines scoring over 90 points within one denomination of origin. It must be kept in mind that the Peñín Guide is the most prestigious guide to wines from Catalonia and Spain, with editions in German, English, and Japanese, making it an indispensable point of reference both nationally and internationally. It is used by sommeliers, wine lovers, journalists, importers, etc. from all over the world to choose the wines to be included on their wine lists.